Hello! Rachel here with a fun and easy idea for a Halloween candy jar. 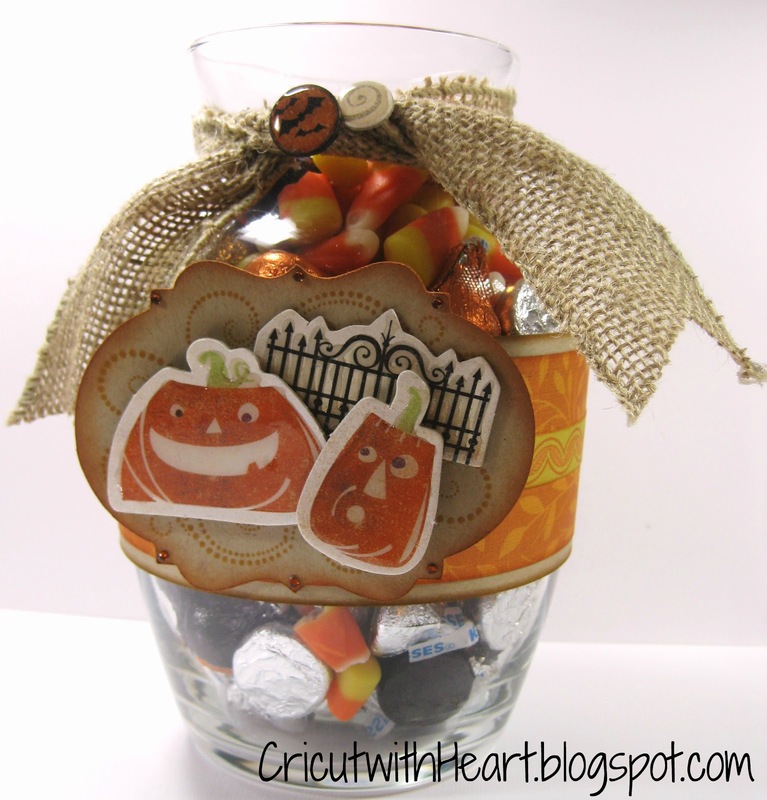 I started with a glass vase that I found for $1 and filled it with some of my favorite Halloween treats: Hershey's Kisses and Brach's Candy Corn! 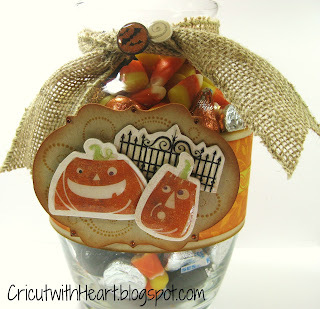 Then I wrapped some of our awesome new Burlap Ribbon around the neck of the vase, and attached two small decorative pieces from the Moonlight Complements Dimensional Elements which I first covered in Liquid Glass. I love how the Liquid glass makes it look like epoxy! Then I cut this Cricut Artiste Accent 3 fun shape from page 64 of the handbook, the "V" key. I cut it out at 2 3/4" from Kraft cardstock and inked the edge with Goldrush ink. I stamped a flourish shape from Love Life in the background, then attached the pumpkins and fence shapes from Moonlight Complements with 3-D foam tape. I added some Sparkles around the edge for a final touch. Gotta love the bling!